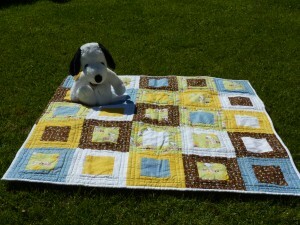 This is for Baby “Squirrel”, a little boy or girl we expect to arrive any day! Knowing how hard it was to find a squirrel invite for Squirrel’s baby shower, I was shocked that I was able to find Kate Spain’s Central Park fabric including this adorable SQUIRREL! 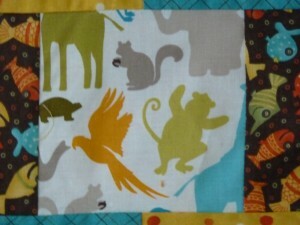 I blogged earlier about my process and progress on the squirrel quilt at This week’s project. 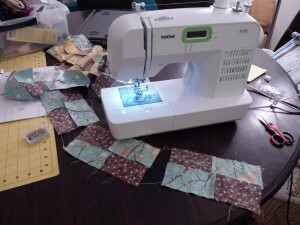 I should have taken a picture of when I was quilting, because there was one point where I was forcing nearly the entire bulk of the quilt through that SMALL area to the right of Flossy’s (the sewing machine’s) needle – it was ridiculous. 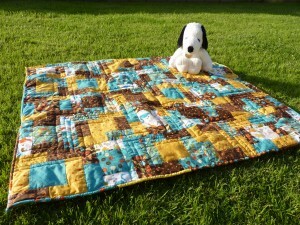 I’m so excited to send this off to Squirrel’s parents. 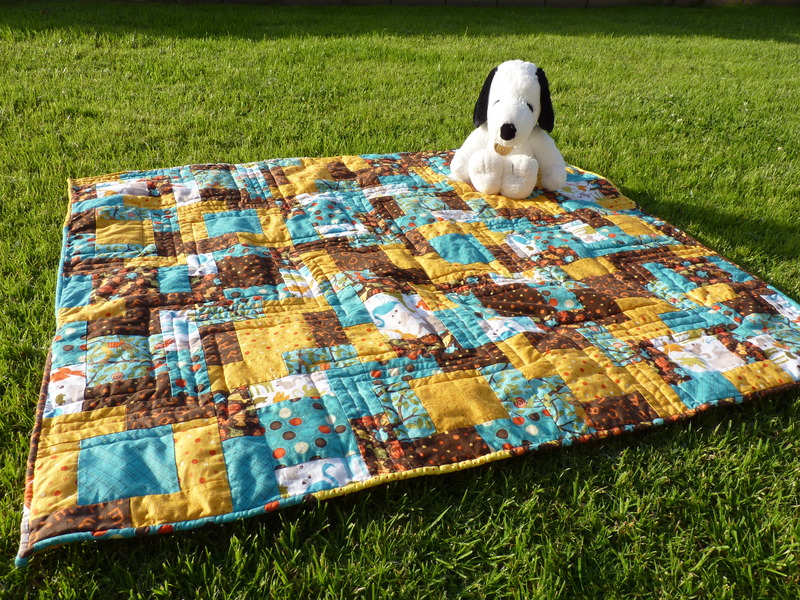 I’m working on the binding for the brown/yellow/blue quilt (I call it the “squirrel” quilt for reasons that will be apparent very soon! 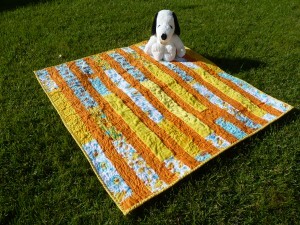 ), here’s a look at a quilt I finished last month. 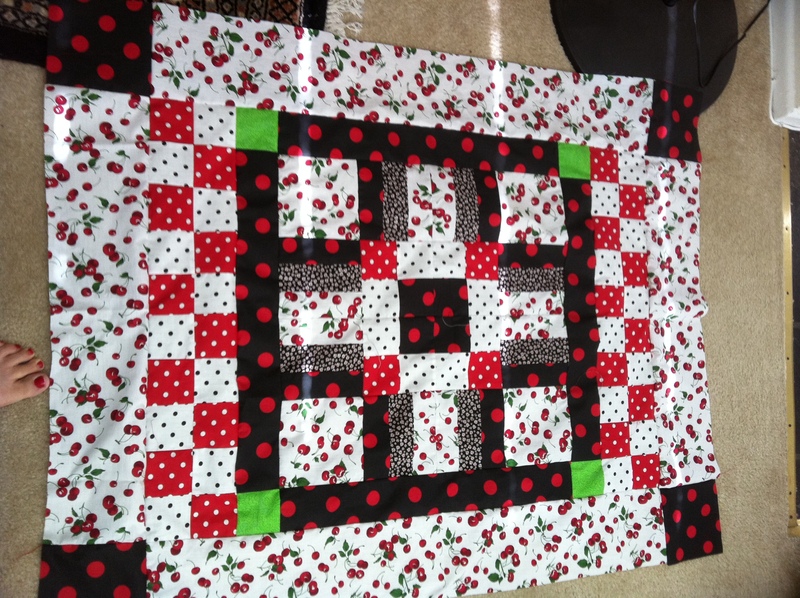 I had a quilting kit from Joann’s that I thought would be perfect for a gender-neutral quilt. 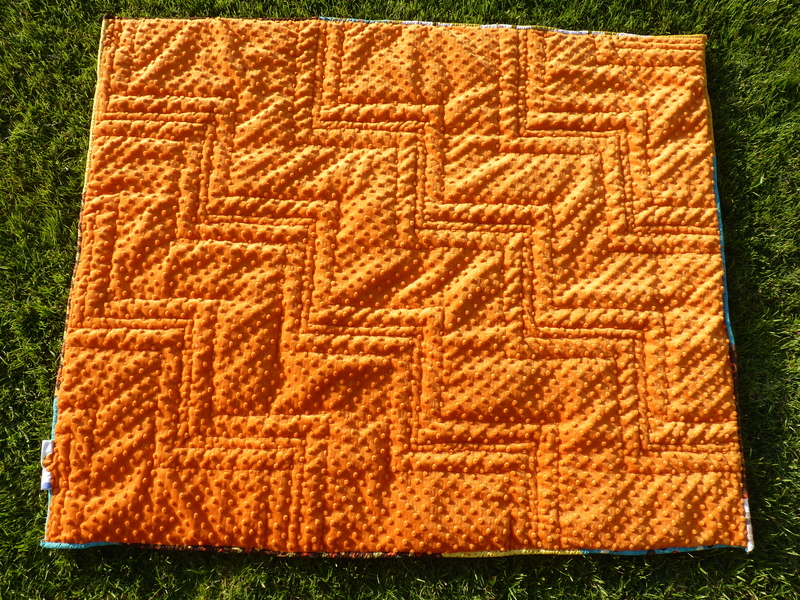 Except I found the pattern quite boring – a border of squares around a big solid center. 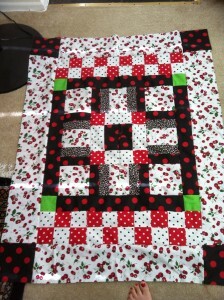 I also found that I didn’t like some of the fabrics in the quilt, as least not for use here. Finding the BUYING of fabric to be most favorite part of quilting, I’d already started building a stash, so the entire top was fully a stash-busting effort. I decided to go with a simple strip piecing, and cut a bunch of 3″ strips that I pieced together, and I had the top basically finished in 2 days. 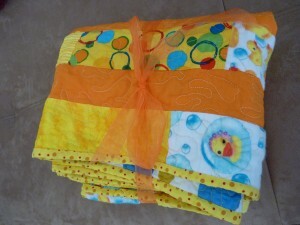 I found this happy background fabric, which carried over the bubble/dot theme that was most prominent on the front. Then I broke out the free motion foot. 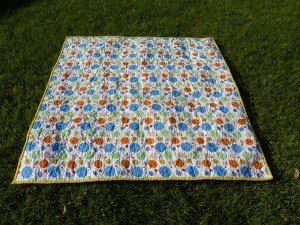 I did some practicing, found a groove, and quilted nearly the entire top in one night in this strange variation of a stipple. I’d like to get better (MUCH better) at it, but I was really happy with the first attempt. 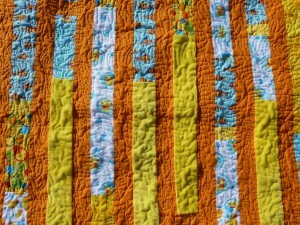 Within 2 nights, the quilt was quilted, and then it was just a matter of binding. I believe I’m the world’s SLOWEST binder (hand sewing takes me FOREVER), but I’m not yet confident enough that I can pull off a machine-binding technique. 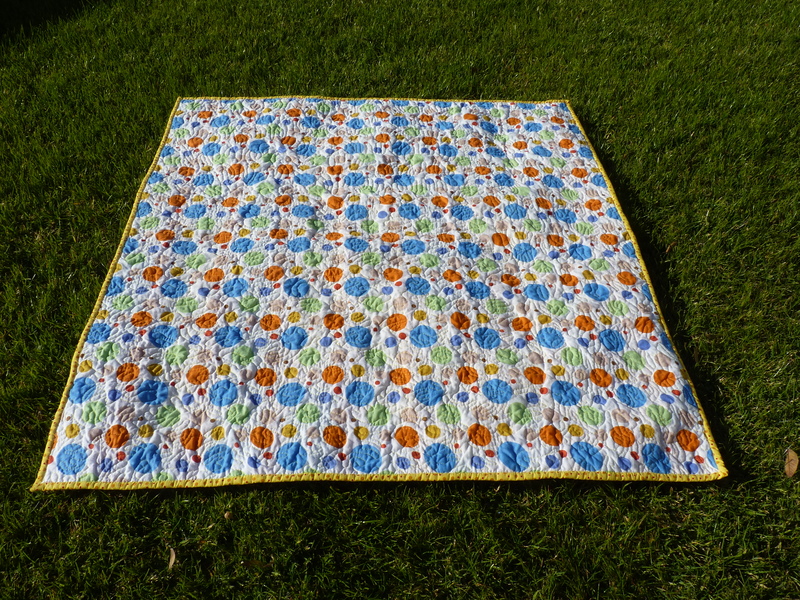 I had hoped to finish the quilt in time for the baby shower, but I was about 10 inches short of finishing the binding when the day came around. 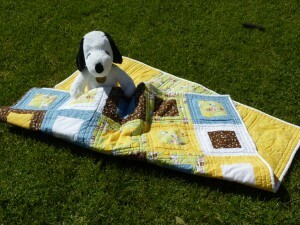 So I wrapped the quilt up with a note that I was going to take it home and finish it!! The parents are super efficient, so I actually had the THANK YOU note for the quilt before I had it in the mail to them! (In my defense, the TY note arrived 2 days after the shower. 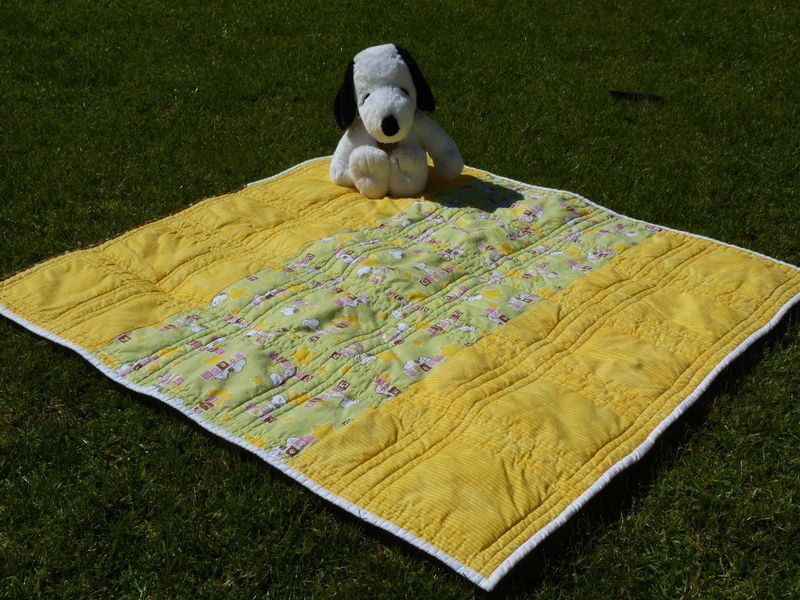 The quilt – washed and ready – went out on the 3rd day). 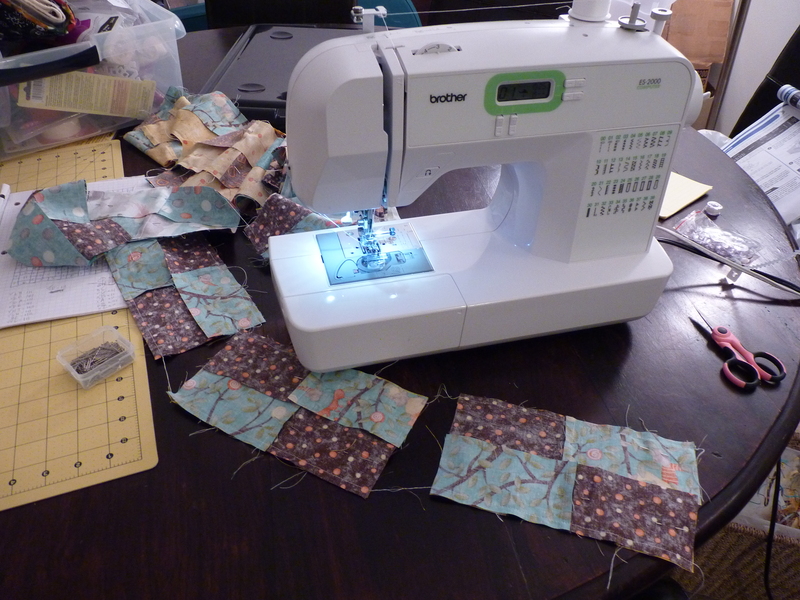 It’d been a little bit of time since I had the sewing machine out. 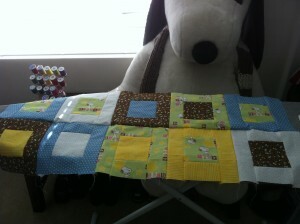 Between prepping for an out of town meeting and being out of town, I was up to almost 2 weeks of no sewing. 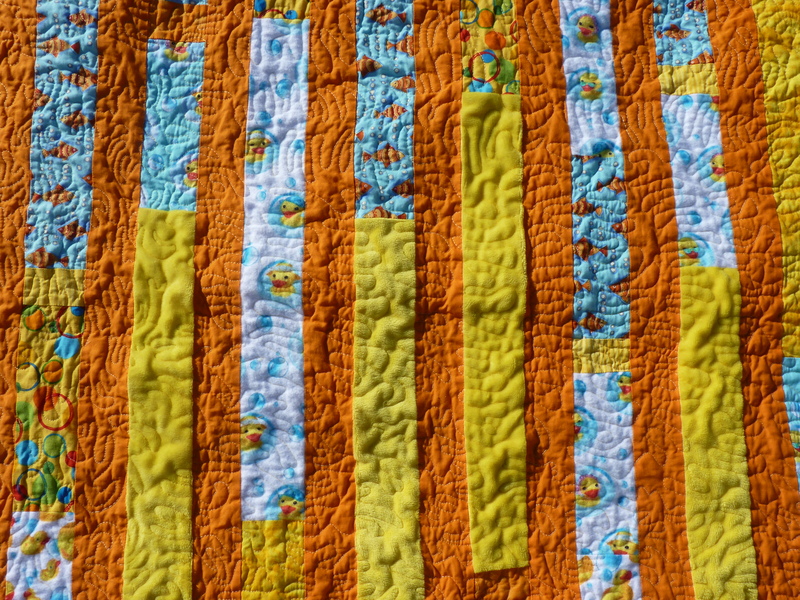 I was really looking forward to getting back (I have this fear that I’ve forgotten how to free motion quilt, but we’ll get to that one later) and getting something done. Top priority: the quilt for the baby coming in April. 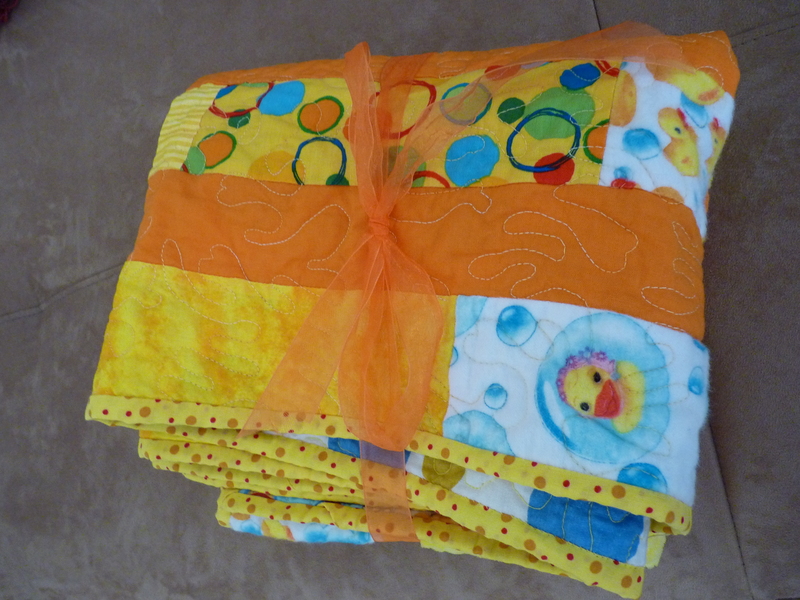 I found the fabric a couple of months ago, so once I decided on a pattern, I was ready to go. 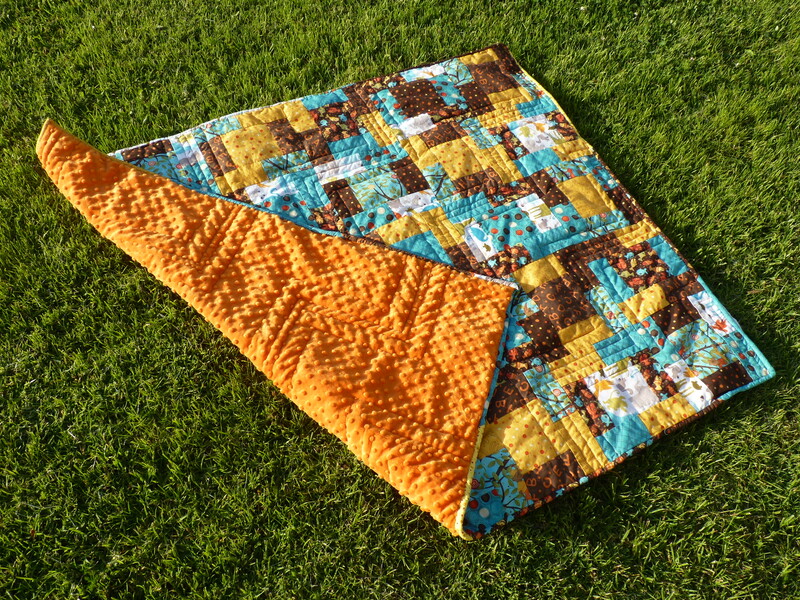 Not being too satisfied with my improv piecing abilities, I decided on a block-based square based on a quilt I saw on the internet. I did some calculations and started cutting. Sunday morning, I wake up and it’s a little rainy, so I proceed to cut some more and get everything ready. 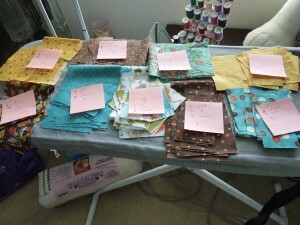 You can see all of my nice little piles, with post it notes and counts, lined up on my ironing board waiting for me. This is definitely one of the bigger lessons I’ve already learned – PLAN out the quilt, cutting and all. If only I were this organized in all aspects of my life!! 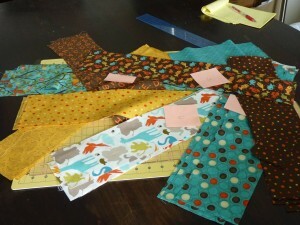 During the evenings this week, I sewed pieces together in bunches. My favorite time (and thread!) saving trick is to chain the various pieces together by not cutting the thread after I complete the stitching of each piece. 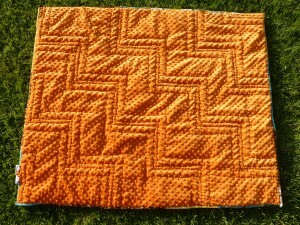 I just pull a bit of extra thread and put the next piece in… The picture above shows a chain in progress of my 30 blocks. And my trusty little machine. Her name is Flossy. A couple of nights ago, I actually finished piecing the entire top, so all that’s left now is basting it all together and quilting. 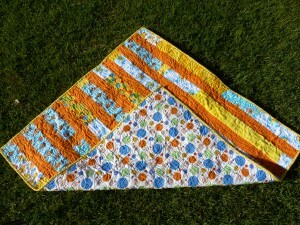 I’ve decided to go with a geometric zigzag – I hope I can pull it off! More pics to come . . .